A 6,000-year-old forest inhabitant awakens to find life in the forest around it in crisis. Plants, trees, animals, and birds are moving north to escape increasingly heated air, even as mass extinctions take place around the world. The inhabitant stirs and remembers it has lived this before and knows what to do. Sci-Fi? Not really. A pair of researchers from Canada and England suggest ancient fungi could colonize the stressed roots of struggling trees to increase their survival during this time of enormous climactic change. The theory, called the "paleosymbiosis hypothesis," is discussed in the journal FEMS Microbiology Ecology. The field of paleoecology is concerned with how ancient organisms interacted with their environment in a time long since passed. Lucky for us, the field is by no means a one-way street, because findings of how life worked long ago could be helpful for us — especially as we struggle with climate change and its cascading effects on the natural world and our environment. In this study, scientists took a broad look at existing research that examined the characteristics of "mycorrhizal mutualists." That means that the fungi — like mushrooms — that live in peaceful coexistence with another species, like trees. In this study, the fungi have a mutually beneficially relationship with the trees. By living either within tree root tips or on them, the fungus gain access to carbohydrates, like sugar, by tapping into the tree's circulation system. By hanging out where the trees are reaching into the soil, the fungi help trees absorb nutrients. Many plants and trees have these mostly unseen relationships with the fungi at their feet, which makes the soil microbiome in a forested landscape very important to its survival, especially when it is under stress. The idea of fungus and trees living together in peace and prosperity is not new. This study advances the theory that tree-hugging fungus has been waiting around for millennia, waiting for ripe conditions for return. This study discusses some interesting ideas for people without a lot of background in "paleosols." Paleosols are the layers of sediment or soil surface that were, like it sounds, formed in a far distant past. These layers are not related to the upper soil layers of present-day but can be exposed with upheaval and erosion. Fungus may have survived in permafrost or beneath glacial layers and remained viable to present day. These ancient microbes could become available in a couple of ways. Another idea is that friendly fungi may just co-migrate along with the trees and plants over time, and as they move northward to escape the heat. And another idea is that long-lived fungi "propagule" reservoirs could exist in soils that help plants and trees (and themselves) as climate conditions change. A "propagule" is the part of a plant or fungus that can give rise to new life. With fungi this means spores, with that pumpkin that you left in the garden from last Halloween, it means the seeds. While accepting that all these types of fungal mechanisms exist, this paper concentrates on the first idea: that "ancient and viable inoculum" could form new relationships with present day hosts like trees. The millennia-old fungi could exist in "resistant propagule banks," that could start new fungal communities today. Reservoirs of dormant microbes live below ground. The farther down you go, the smaller the community of microbes. 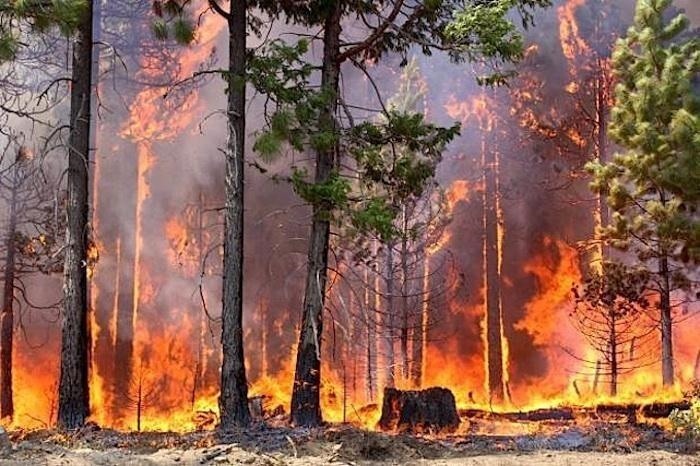 Soil microbiomes in fire-prone areas have higher abundance of microbes like fungus, which exist in deeper mineral soils where they can survive the heat of a forest fire. The age of this dormant microbiome and varies from location to location, from months to decades, and to the much older "sclerotia" of paleosols. Another twisty word, "sclerotia," just refers to a hard fungal body that is designed to survive for a long, even extreme period. Part of the research reviewed by the study authors found progressively older sclerotia at increasingly deeper depths — which makes sense. The paleosols were accessible to the deep roots of some modern plants. The authors point out that deeper rooted plants probably interact with fungi of various ages underground. In the presence of a viable host, the much older fungal sclerotia could break their dormancy and take up residence with a new generation of trees and plants. Recent experiments using very cold temperatures to preserve fungal inoculums were successful. It is not yet clear, however, how long you can freeze a mycorrhizal mutualist and not kill it. Ancient fungal communities have been located in permafrost samples, and glaciers. Ice sheets, as they melt, could offer up ancient microbiome samples as well. From buried forests to extreme hot-dry environments, durable fungal spores may begin seeding new communities as they are accessed or uncovered. Old Fungi with New Hosts — What Does It Mean? Researchers need to do more studies on the viability of microbes from permafrost and paleosols. In addition to adding to our knowledge of how plants and trees growing above the ground could be getting a survival assist from what grows beneath, these ancient fungal companions could offer a boost in genetic diversity for vegetation currently threatened by habitat loss and climate change. The study authors suggest higher biodiversity in these mutualists "can be expected to reduce rates of local extinction," and offer greater functional capability in the form of enhanced growth in circumstances under which the host might otherwise have died. Discussing strategies for future research, the authors also suggest that a "deep time legacy effect" may emerge with further study. This is the idea of "legacy effects" on historically recent soil communities. It may be that emergent members of ancient microbiomes could help forest and other ecosystems adapt to the unstoppable impact of climate change in our time. In a press release, co-author Jason Pither of UBC Okanagan, notes: "Could fungi actually remain dormant and viable for thousands of years and be resurrected by plants growing today? Our research suggests it's possible." While the idea of ancient microbes rising to the aid of a contemporary world in trouble seems far-fetched, it may be closer to the mark than it seems. Adds Pither, "fungi that were active and successful during past climate conditions could help Canada's forests withstand the stresses of modern climate change."